Quickly and easily project artwork, designs, prints, and more with the Artograph Prism Art Projector. This tabletop projector is specially designed for projecting a wide assortment of originals, such as patterns, sketches, and line drawings. It reads images up to 7" × 7" and can project oversize images in sections. Its horizontal projection range allows for enlargement up to 20X and reduction down to 80% of the original size by simply reversing the lens. 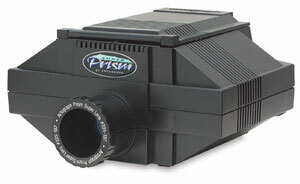 The Artograph Prism Projector weighs 8 lb (3.6 kg). Made in the USA. 120V. UL approved. Replacement Photo Bulb — Two standard 250W bulbs are included with the projector. The advantage of using an ordinary 250W bulb in a projector is its longer bulb life. However, the 250W photo bulb is recommended because it gives a much truer reproduction of color. Lasts approximately 25 hours. Super Prism Lens — Upgrade your Prism Projector with this superior quality, three-element color-corrected lens. The Super Prism Lens has better accuracy than the standard Prism lens, giving you finer detail and increased image clarity, even when images are enlarged 20X. It's ideal for photographs that require fine detail reproduction. 230 mm, f/4.5 lens. The Super Prism — With its finer color and enlargement capabilities, the Super Prism is the choice of many fine artists, muralists, and airbrush artists. It includes both the Prism (see above) and Super Prism lenses. The Super Prism lens is a superior quality, three-element color-corrected lens, ideal for photographs that require fine detail reproduction. It has better accuracy than the Prism lens, and a horizontal projection range of 3X to 20X. 230 mm, f/4.5 lens. Weighs 9 lbs (4 kg). ® Artograph is a registered trademark.™ Prism is a trademark. The high-intensity photo bulb lasts only about 25 hours. The projector can operate with a normal 250W bulb, but the photo bulb provides intense and vivid color. Photo bulbs are difficult to find except at specialized retailers. It is a good idea to have some spares on hand. Learn about the features and benefits of Prism and Super Prism projectors from Artograph. Which one is right for you? Before you buy, find out more about these Artograph projectors and determine which one best suits your needs. From the beginner to the professional we are sure to have the right projector for you.